PT Astra International Tbk - Isuzu Sales Operation (ISO) - Astra Isuzu Sales Operation or known as Astra Isuzu is a reputable automotive company in Indonesia under PT Astra International Tbk (Astra Group). Astra Isuzu Sales Operation is a corporate operation unit within Astra Group, the strongest diversified business conglomerates in Indonesia. Astra Isuzu Sales Operation operates primarily as sole distributor of Isuzu Motor in Indonesia, specifically for the sales of Isuzu Motor Light Commercial Vehicle (LCV) product line. Astra Isuzu Sales Operation has core business competencies in distributor, sales and after sales service for Isuzu Products and services in Indonesia. 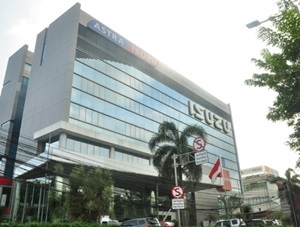 Based in Jakarta, Astra Isuzu now has 52 units of Astra Isuzu direct sales outlets spread in all over Indonesia. According to Astra Group Annual Report 2016 as cited by JobsCDC.com, Isuzu recorded total sales of 16,848 units in 2016. This total sales number is lower by 13% from total 2015 sales of 19,350 units. JobsCDC.com now available on android device. Download now on Google Play here. Please be aware of recruitment fraud. The entire stage of this selection process is free of charge. Astra Isuzu Sales Operation - Management Trainee Astra Group April 2018 will never ask for fees or upfront payments for any purposes during the recruitment process such as transportation and accommodation.